The blocks like it when things go blow. Pick out a spot in the middle of the clouds to test blowing up the red blocks, knocking off the metal blocks, and saving the pleasant yellow orbs and squares. Compare and contrast your options for destroying the blocks. 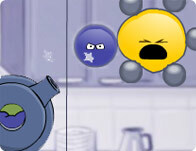 Use the metal objects as bullets to knock off all of the red blocks as you crush and explode everything around you! Use your mouse to click on the blocks and complete the boom blocks puzzle!